This year’s 9/11 Film Festival will be held in three venues over four days and will have a total of five different programs. The film festival runs from September 9th through September 12th and is being held in theaters in Oakland, San Francisco and San Leandro, CA. The 2010 9/11 Film Festival opens Thursday, September 9th at the Grand Lake Theater in Oakland with a nine hour program. It then moves over to San Francisco’s intimate VIZ Cinema in Japantown for a Friday night double feature and filmmaker Q &A. On Saturday, September 11th the film festival continues with two all day programs, one at the VIZ Cinema and the other at The Historic Bal Theatre in San Leandro. The festival closes with an afternoon program at the VIZ Cinema on Sunday. Highlights of this year’s festival include the world premiere of the film Hypothesis, the North American premiere of the film War Promises and presentations by Prof. Peter Phillips and Prof. Mickey Huff of Project Censored, physics professor David Chandler, and author and filmmaker Servando Gonzalez. The film festival also features the San Francisco premiere of several international films, including Zero: An Investigation into 9/11, 9/11 False Flag and War Promises. 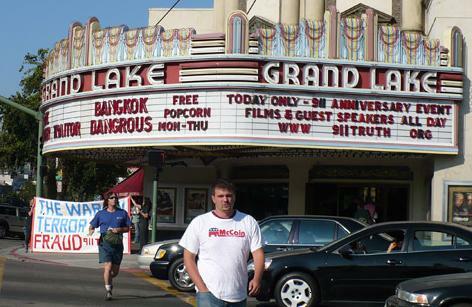 Last year’s festival was a two day event held at the Grand Lake Theater in Oakland. The 9/11 Film Festival is produced by the Northern California 9/11 Truth Alliance and is co-sponsored by the San Francisco Bay Guardian, The Grand Lake Theater, VIZ Cinema and The Historic Bal Theatre. Each film or double feature at the VIZ Cinema in San Francisco has a separate $10 admission price. That is so TOTALLY AWESOME it's UNBELIEVABLE!!! Now, can we get a THIRD LIGHT BEAM in those graphics, please? There's a NATIONWIDE BUILDING WHAT? CAMPAIGN GOING ON and your two-beamed graphics are going to CONFUSE THE HECK OUT OF PEOPLE. Keep up the AWESOME WORK, San Fransisco!!! LV911Truth on Thu, 08/26/2010 - 11:55pm. Another great group of people shows us how to get it done. Joe on Fri, 08/27/2010 - 5:26am. Millions of people believe that evidence proves that Western intelligence services organised the hideous attacks on New York and Washington on 11 September 2001. Even the mainstream media have stopped defending the official version and now prefer to ignore the issue altogether. Distrust in Western governments grows as the wars of aggression waged by the USA and NATO continue to be justified with these “false flag” operations. Ever harsher domestic laws are being passed to crush all outrage and resistance in Western populations; at the end of the day they aim to unleash the German military on German civilians, instead of allowing morality and ethics to flow into day-by-day policymaking. That morality and ethics long ago stopped playing a part in political decision-making is shown by the use of internationally outlawed weapons in all the wars NATO has started. At best, one has heard of “depleted uranium” after seeing the film “Deadly Dust” by award-winning Frieder Wagner. But even that film is systemically blocked out and banished, although, or perhaps because, it shows the horrific consequences of the use of these uranium weapons. Among those aghast at the actions of NATO and the complicity of Germany in such internationally illegal wars of aggression is Christoph Hörstel, for many years foreign correspondent and editorial head of the German public broadcasting network ARD. Of like mind is Giullietto Chiesa, a Member of the European Parliament, who slams the ignorance and disinterest of most of his fellow Members. What they don’t know is explained in the film “War promises” by insiders and whistleblowers. Annie Machon was a spy with the British MI5 and reports on false flag operations, as do Andreas von Bülow and Jürgen Elsässer, who possess enormous insider knowledge from their membership of the parliamentary committee supervising the secret services, and want to bring it to the public. Eight years after 9/11 millions of people have linked up through the Internet to jointly rebel against this criminal system. What was still dismissed as a wild conspiracy theory until just a few month ago is now regarded as proven, raising the question how we, the people, handle this situation, in which those who govern us have on their minds anything but our wellbeing. Joe on Fri, 08/27/2010 - 6:17am. coming out of San Francisco. This showing should be a great success. All the major Cities should do the same thing. Gotta get the word out there! 9-11 Joe on Fri, 08/27/2010 - 7:32am. The film is a glimpse into the pivotal life of Professor Steven E. Jones by a young filmmaker, Brett Smith, when Professor Jones’s criticism of the official explanation for the destruction of the World Trade Center drew national attention to him and Brigham Young University. As we see Professor Jones's wife, son, and grandchild in the film and we become aware of his gentle, friendly, and caring nature, it becomes clear that it hurt him deeply to be forced to stop teaching. When he speaks clearly about his “pursuit of truth,” I can see in him the spiritual resolve of Gandhi and Martin Luther King Jr., both of whom practiced “satyagraha,” “satya” meaning “truth” and “agraha” meaning “pursuit of.” Satyagraha was the term created to describe the non-violent movement that Gandhi led, which also began on a September 11th, in 1906. Professor Jones may laugh when he is nervous or frightened, but he clearly has courage, born out of a great love for his family, his community, his country, and the world. Fortunately for film enthusiasts, when one door closes, another opens: the film festival premiering Hypothesis will also include The Hard Evidence Tour, Professor Jones’s November 2009 talk in Sydney, Australia which sheds more light on 9/11 truth developments since 2006 and the growing numbers of scientists, architects, and engineers who have joined Professor Jones in his pursuit of truth. Joe on Fri, 08/27/2010 - 9:23pm.